Hi everyone! Here is a new report on our work to release a Xen Orchestra 5.0. This time, we are talking about a big change from all previous versions, even those from the beginning. We could say a new paradigm: to be "search" centered in the home view. The interface is still "work in progress", thus GUI in those screenshots is far from definitive. It appears we got some kind of non-planned XO usage: a LOT of XO deployments are done in medium/large infrastructures. Let's say, "medium" is about 50 to 100 VMs, and "large" up to 2000+ VMs. And XO was initially developed for a very small infrastructure (10 VMs? ), as tool for everyday Xen usage. Today, XO is another beast (replication, continuous delta backup, load balancing, cloud capabilities, self-server for XenServer etc.) but we never changed the UI concept. If xo-server is able to handle a lot VMs and hosts, GUI is another challenge! Basically, you can see the "Pool > Host > VM" organisation. 6 months ago, we implemented an "advanced" search bar: not bad, but far from being perfect. You could only filter, not sort or make actions on those filtered results. What could be a good solution for everyone? This combo of ideas could lead you to almost never use another view than this one to manage your whole infrastructure! But let's use some real examples to give you some ideas. You can clear the search by clicking in the button inside the search field, you'll see all VMs. You can also expand a VM (or all) to see more detailed informations, like vCPUs number, RAM, number of disks and network interfaces, IP addresses and tags. You can also see we are filtering on tags, meaning all VMs with the "dundee" tag. The filter syntax is pretty simple: you can search in any object property or on everything (if you don't specify any property). A space between two expressions is a "AND" ("OR" is |). You also have a not filter (! ), e.g all non-running VMs could be displayed with !power_state:running (so you'll have all halted, paused, suspended VMs). xenTools:"out of date" will display all VMs without outdated tools! Handy isn't it? power_state:run os_version:distro:!debian will display all running VMs which are not having Debian running on it. You could even find distros with their kernel versions! Okay, good, but you won't remember this, especially at the start. 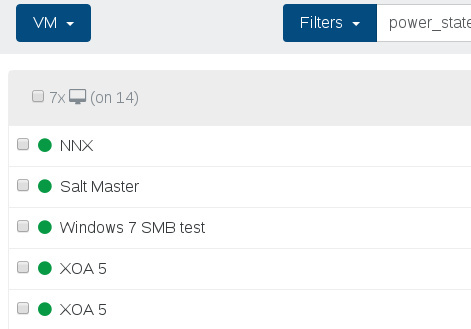 So we built some pre-made filters to give you this in 2 clicks: "Running VMs" or "Halted VMs", Virtualization mode etc. You can also choose some pools or hosts via their "select" fields: they will display only VMs which are on them. Same for tags, you can add multiple tags to find what you want. That's not it! What about clicking on a VM state (Running for example, the "green dot") and filtering instantly all running VMs? Same story on a tag inside a VM: just click on it, it will add this tag in the filter. Sorting those results is the next step to give you a perfect control on your whole XenServer environnement. You could sort by VM name, CPU number, OS name, number of disks, whatever. You can do a lot of stuff with this, especially to get an quick insight, even if you have a large number of VMs. Now you get your results, maybe you want to do actions on those VMs? Remove them, migrate them, stop them? First, the slowest thing on a browser is the DOM. Render a page with hundreds of elements is really, really (really) slow. The idea is to avoid it at all costs. Two possibilities: pagination or infinite scroll. They are similar in performance perspective. Then anyway, why display 1000 VMs at the same time? Even if the browser is fast enough, could you even find something in this pile of VMs? That's why having a good filter/search system is really important. We are pretty sure than combining a nice UI with pre-configured searches (for people who are not used to search syntax) AND a advanced filters is something we want to release for the 5.0 release of Xen Orchestra.